Previously i mentioned few posts about cloudstack and openstack with fare comparison. I have received multiple request of openstack deployment over cloudstack because of few unique features. 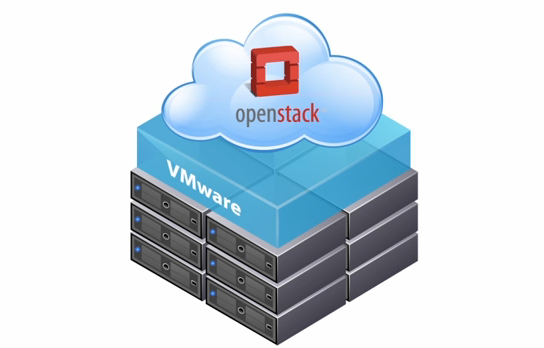 I am a big fan of VMware and in 2014 VMware announced beta version of VMware integrated openstack. and within a short span of time in 1 year VMware has released production grade Opestack (icehouce) and already tested with 2000 VMs. A quick view of Openstack before we start the deployment of openstack. -> Nova is a compute component of openstack and it will talk to vCenter and spin-up VMs. 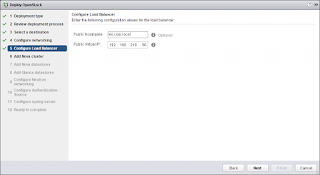 Nova will understand vCenter clusters instead of ESXi hosts. -> Cinder is a storage component which will talk to block storage (VMDK) and in vmware integrated openstack it will use VMFS file system only. Its also responsible to spin up disk and attach it to VMs. -> Glance will provide the image catalog repository or catalog service. It will also talk to shared storage to understand VM and publish as catalog template. 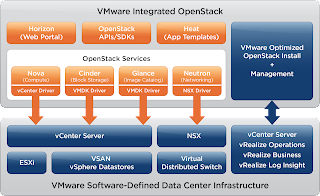 -> Neutron provides networking component in openstack, it can integrate with NSX and provides security groups (micro segmentation of security) and it can also integrate with vSphere Distributed switch. I would personally suggest NSX because it will provide security group but for the test we can use DVS. In order to deploy Openstack you gonna need separate management cluster for the openstack component deployment and rest of the clusters can be used as compute fleet. 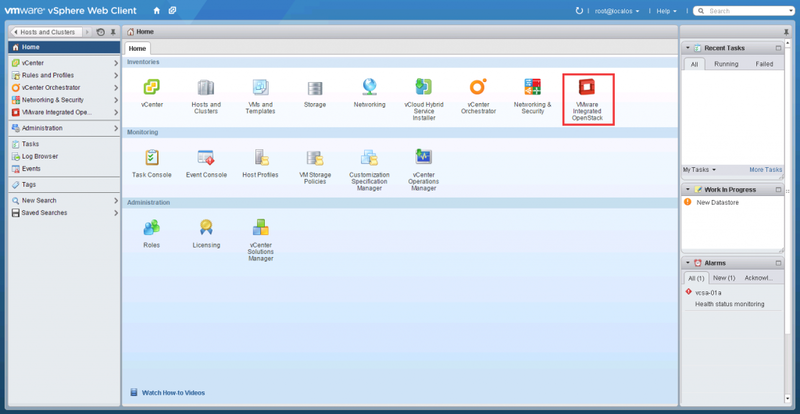 All these mentioned features are already available in icehouse but VMware integrated openstack provides management and installation of openstack in completely GUI in Web Client as a plugin. The best thing i love about ova is it will deploy all the openstack component in HA mode with dual components. I will try to summaries deployment of openstack in brief. 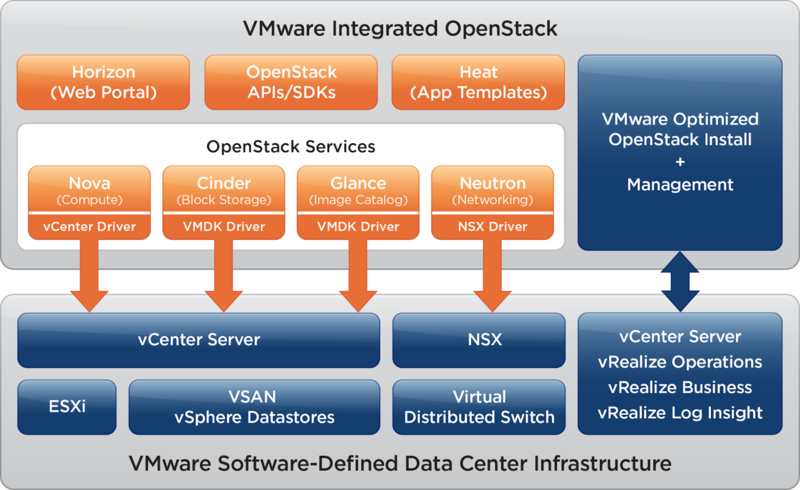 The deployment of VMware integrated openstack is quite straight forward. You can download OVA from here. Once you deploy OVA you will get openstack plugin in VMware web client. The OVA will not contain openstack component but its a deployment manager it will deploy memcahce, rabitmq, dhcp agent, database services etc. After clicking on Openstack icon you can start deployment of openstack by clicking on Deploy openstack hyperlink. It will open wizard where you have to enter the vCenter connectivity information. Then in the next screen you have to select in which cluster you wants to deploy openstack components. 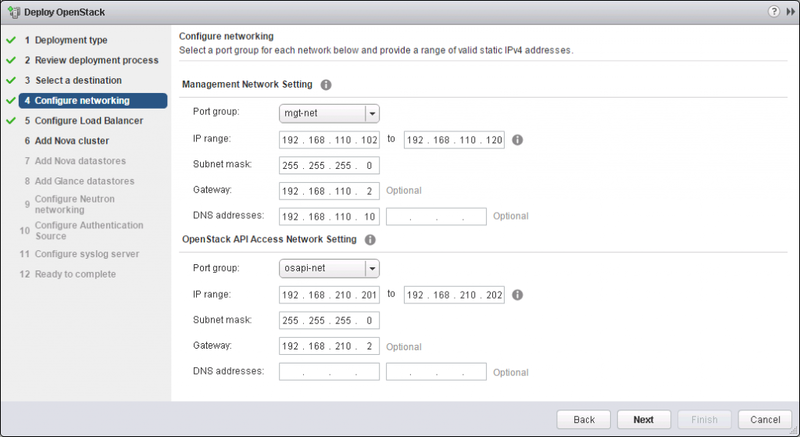 In the next screen you have to provide two networks one for the users will connect in using horizon dashboard and another one for the management traffic between openstack components and vsphere. The next screen will ask for loadbalancer's external IP. 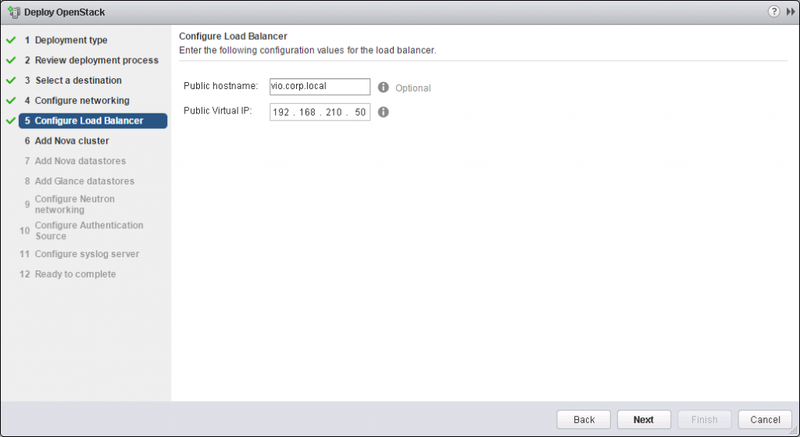 This loadbalancer will provide load balancing of openstack's dual components. Then in the next screen you can add your compute fleet by adding second cluster (Nova cluster) and as the process follows you can add Cinder storage (VM storage), Glance storage (Template storage). In the Neutron network settings we will select VMware VDS and at last openstack admin authentication and syslog server configuration.